Two great meals for the week of July 9. The moment I saw the food images that accompanied the press release announcing a new chef at Angelini I knew I wanted to try the dishes. Partly because I have had several great meals at Angelini over the years under previous chefs, but mostly because they were so visually appealing. They tasted as good as they looked. 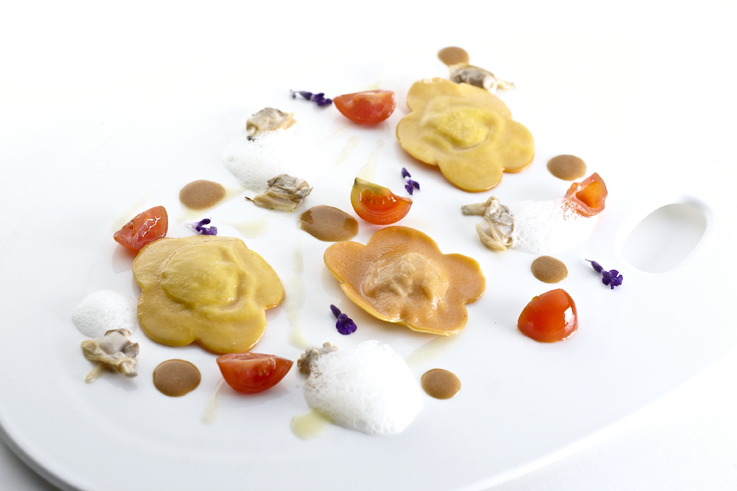 Defined flavours, thoughtful dishes with complexity that highlight the quintessence of the ingredients. 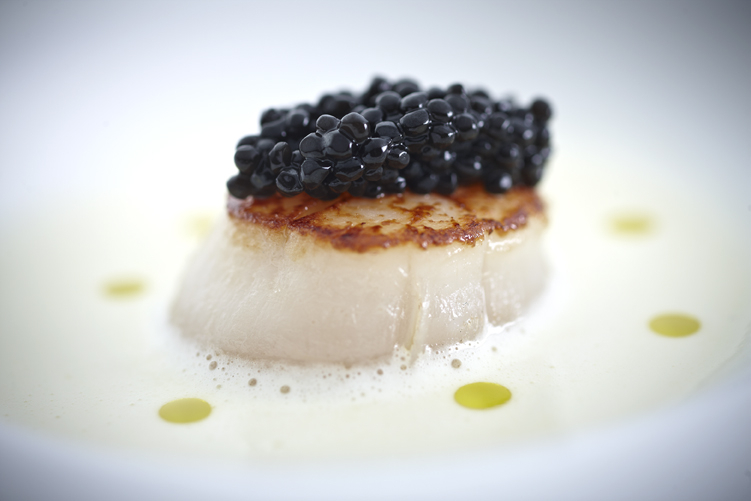 Perfectly cooked scallop with decadence from the “caviar” that is made from truffle juice. The taleggio sauce a flavour complement and so good on its own that I used bread to mop up the remains. If it had been appropriate I would have licked the bowl clean. Looking even better than the photo, served on an artist’s palette plate, the diner is free to mix their own flavours and colours, with dollops of pee puree, intense shellfish broth and more. A surprisingly filling dish. Also enjoyed: Sea Bass “Cartoccio Style”, traditionally cooked in a paper bag, at Angelini it appears at the table in a clear bag tied at the top; it looks very much like a present. A delightful dish of fish and a medley of vegetables and olives. Light, clean, delicate flavours. Also impressive was the Beef tenderloin, goose liver and red wine sauce. Incredibly tender, the foie gras taking the richness factor off the scales, and the sauce the stuff of dreams. Less successful was the dessert platter, there was nothing wrong with any of the items, but there was nothing as impressive as the dishes previously eaten. The second good meal was at Gold by Harlan Goldstein. I am a fan and have never had a bad meal at any of Harlan’s restaurants. I love that his dishes and flavours are as bold as he is and that he remains true to the food he likes to create. My aim with my recent lunch was to try some of the dishes from the new summer menu. I really enjoyed the four I sampled but two of those really stood-out. The Chicken Meatballs. I was less than enthusiastic when I saw chicken meatballs on the menu but it was one of the dishes that Harlan recommended to me during lunch and I am glad I trusted him. On the menu as Chicken Meatballs, Tzatziki, onions, piquillo peppers, cherry tomatoes and mint. Almost fluffy, the meatballs made from organic chicken, taste homemade, in a good way. You realise what a thought out dish it is when you combine a little bit of everything on the fork at the same time as all the elements come together to create more than the sum. The other dish was the Japanese Saga Pork. A big hit of juicy, slightly charred pork that is paired with plump, sweet clams (something I am not normally a fan of), on a bed of wilted organic spinach and brought together by the mildly spicy, nutty Romesco sauce. Romesco is a Catalan pepper sauce, usually made from almonds, tomatoes, oil and chilli peppers. Other new dishes tried were: the vibrant Harlan’s Chopped Salad, and the Russian Borsch that includes slow-cooked beef cheek. your info was highly appreciated.